Twenty-three rib cookers will feed hungry festival-goers this weekend at the Best in the West Nugget Rib Cook-off in Sparks. Twenty-three rib cookers will feed hungry festival-goers at the Best in the West Nugget Rib Cook-off – not to mention the onion rings, funnel cake and copious amounts of booze and entertainment that will draw thousands of people to Victorian Square in Sparks over the Labor Day weekend. But what happens when the festival has shut down for the day and you’re looking for your fourth meal or to continue the festivities? Here are a few suggestions for those who want to know where to party after, where else to eat and where to play in the Biggest Little City. Looking to burn off some of those ribs after the cook-off? Well, there are a few places to dance the night away. 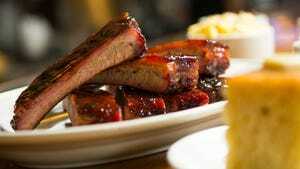 LEX Nightclub located inside the Grand Sierra Resort and Casino is in closest proximity to the rib cook-off. The other option is EDGE Nightclub at the Peppermill Resort Hotel. Both are great options for those looking to get bottle service and the nightclub experience. If hip-hop and fast club music is not your thing and you’re looking to groove to some old-school tunes, then you’re in luck. On Sept. 2, Lincoln Lounge is hosting its Soul Friday night. Feel the funk with DJ Andrew, DJ 50spence and Staxofwax, who will be spinning genuine records and 45s from the ’50s and ’60s. If none of these strike your fancy, then maybe a concert will do the trick. This weekend, Reno-Tahoe will be filled with world-class entertainment. Stevie Wonder will be performing at the Lake Tahoe Outdoor Arena at Harveys on Sept. 2, and the great Carlos Santana is bringing his Luminosity Tour to the Grand Sierra Resort and Casino on Sept. 3. If you want to take the elevator home, book a room at the Nugget Resort Casino, which is hosting the event. Luckily, the resort has some 1,400 rooms so there still are some available. A short drive from the festival lies the Grand Sierra Resort and Casino, Reno’s largest resort property with 1,990 hotel rooms, a spa and 11 restaurants.